So how did everyone do in January? 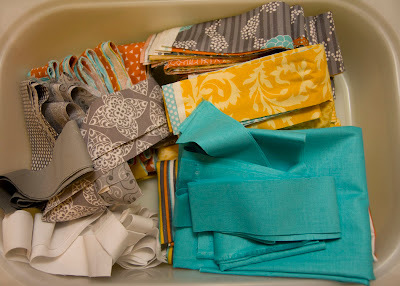 Any stash projects? Although I wasn't perfect in my resolve to not buy fabric. I did pretty good. 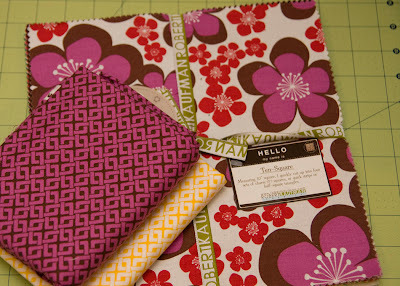 I bought three yards of Kona for my Brrr quilt. 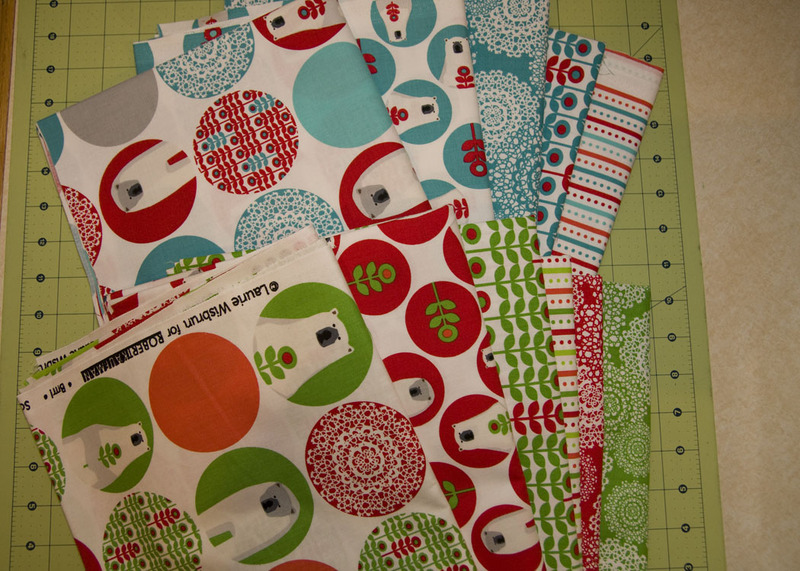 I also bought a few I-spy FQs to swap charms. No "stash building" this month. I felt pretty good about that since my primary goal this year is to work mainly from my stash. 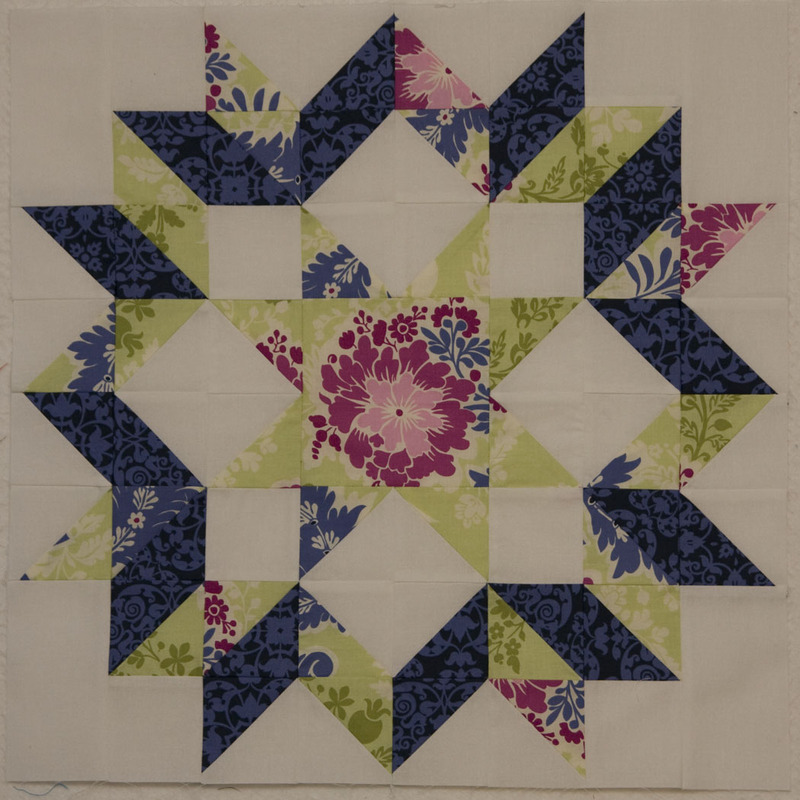 I did finish two projects entirely from my stash in January. How about you? Link up any project made mostly from your stash during January. 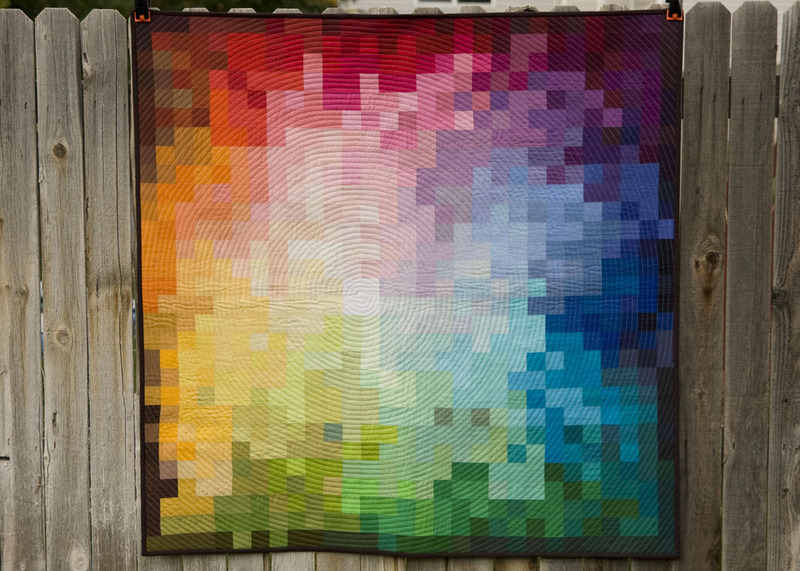 This doesn't have to be a quilt, just a project. It doesn't even have to be finished. 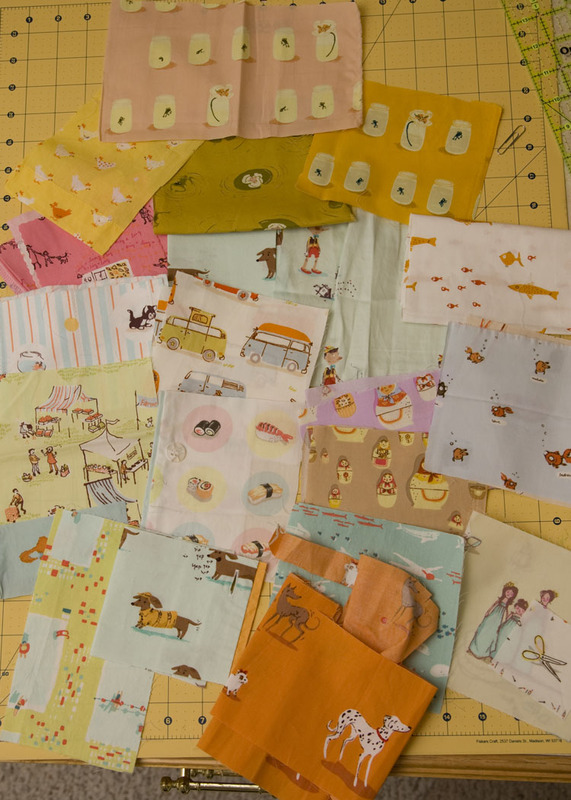 Just share what you are working on from your stash. Add the Slash the Stash button into any old post, create a new post or just add it to your sidebar. Feel free to add any stash projects to my flickr group as well. 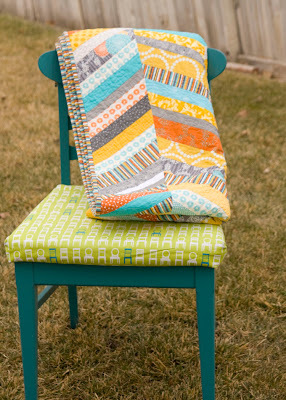 My biggest accomplishment this past week was finishing up my chevron quilt. It's already getting quite a bit of use. 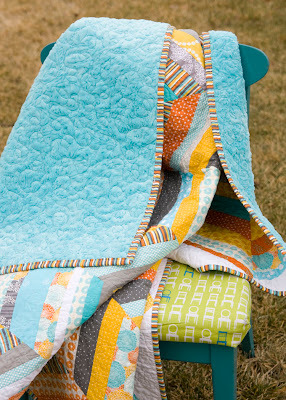 I have a big chunk of my Brrr quilt pieced, but still have a ways to go on that one. 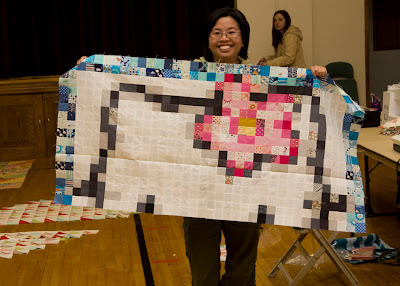 That might be a project for our local Modern Quilt Guild sewing Saturday this weekend. No pictures on that one until it's finished though. 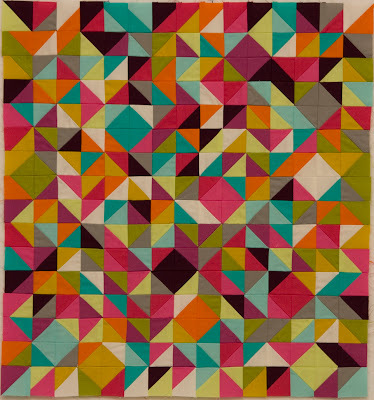 My color quilt is coming along and makes me so happy. I'm working on designing with the purples right now. I have all of the yellows and oranges pieced at this point. 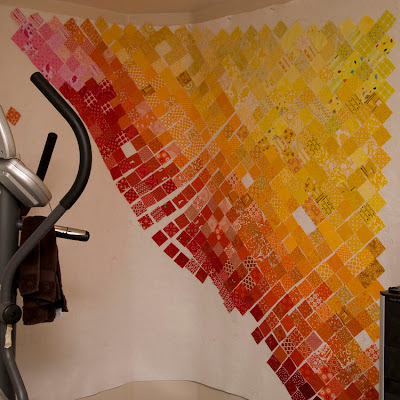 I think the final size will be around 70" square. While laying in bed last night the perfect idea hit me for the back on this quilt. I'm excited to get started on that part as well. Finally, Slash the Stash is ready to go. I have our first link-up party set for next week. 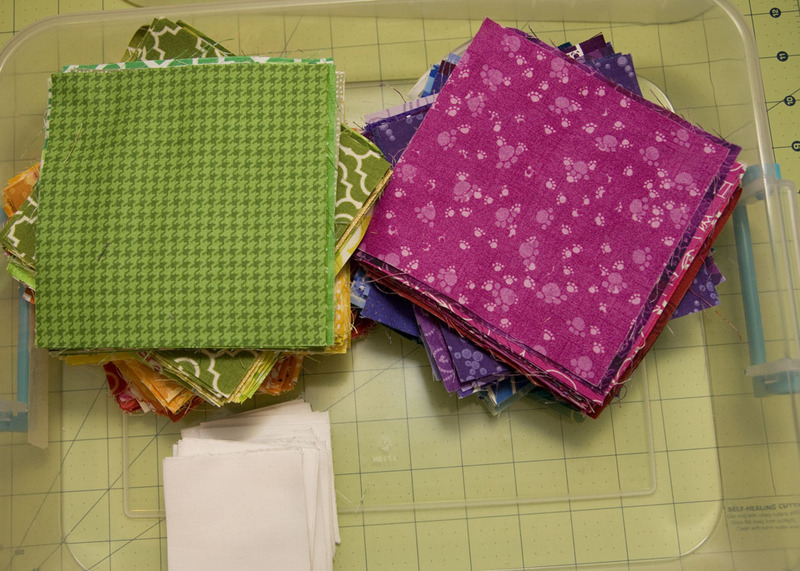 Just link up any project you've made during the month using mostly stash fabrics. Add this button to an existing or new post or your sidebar and link up to show everyone what you've created using what you already have. First off, thanks so much to all of you for your comments and advice on my last post about teaching my daughter to sew. We had a busy weekend, and I didn't have a chance to respond to all your comments like I usually try to, but I appreciated the input. My daughter is 4 1/2. I never really considered teaching her to sew at this point on my machine, but hearing all your stories about teaching young children to sew on real machine was very encouraging. 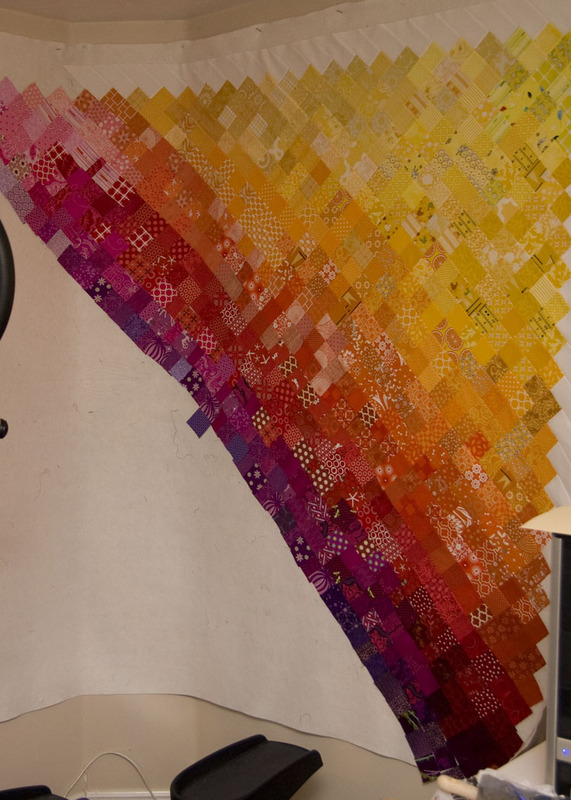 I actually have two machines--my starter Singer machine I rarely use (but still works perfectly), and my much bigger Brother machine I now use. The Singer is the one I plan to let her use as she gets older, but my Brother has speed control so I'll probably teach her on that one. I'll let you all know how it goes once we get started on this new project. 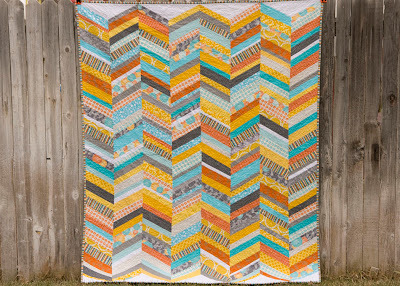 I love the look of all the chevron quilts I've been seeing. There are a couple block tutorials out there as well. The only thing I didn't like about the blocks is the choppy feeling when the base of the block was squared off. 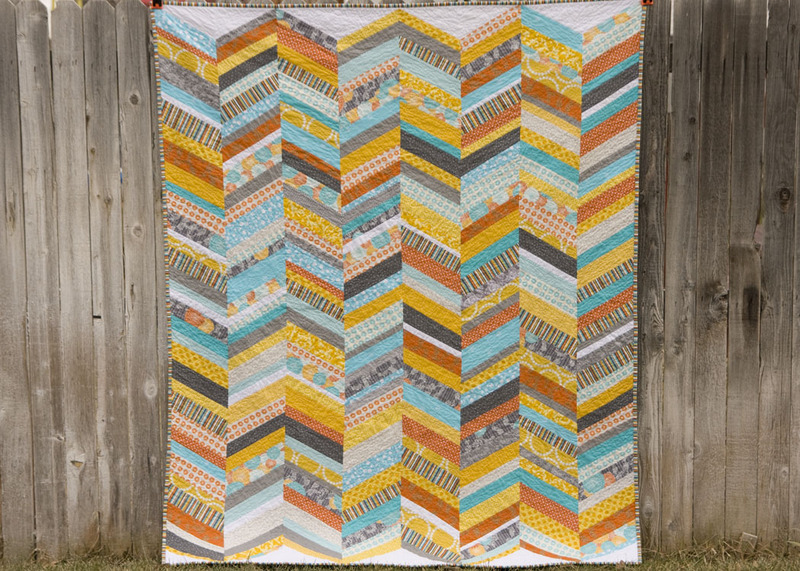 I wanted the quilt made from a continuous chevron. With a little trial and error, I came up with this quilt. 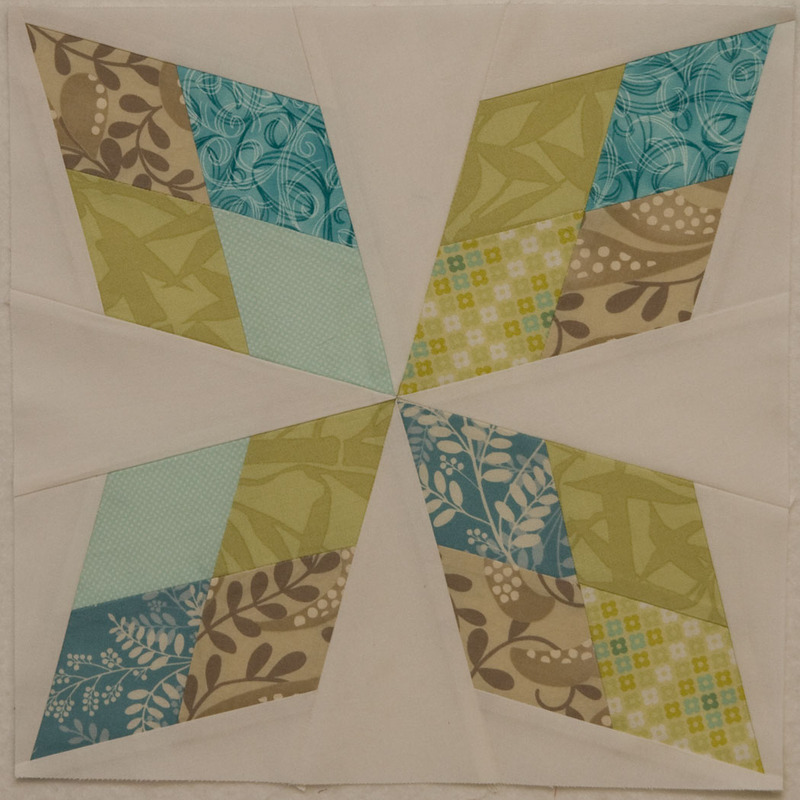 The chevron strips are cut at a 30 degree angle and pieced continuously. 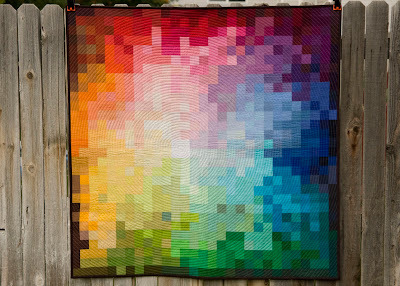 The final quilt is about 56"x70". 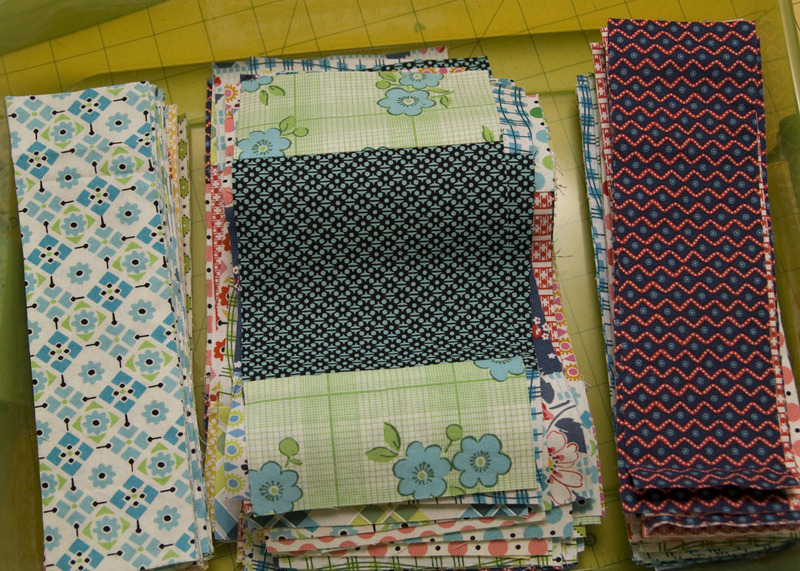 I pieced each individual strip in about three angled sections, squared the sides, then sewed the angled ends together. 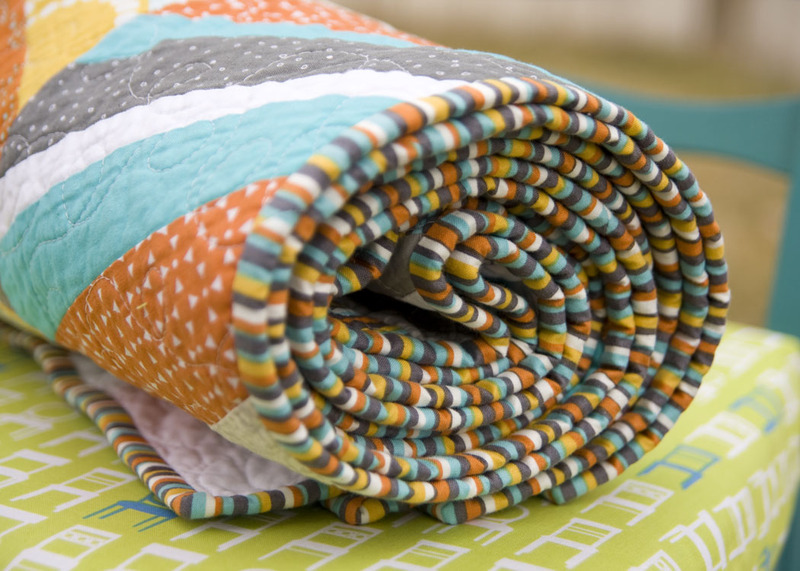 It's backed with minky fabric and so nice and soft. 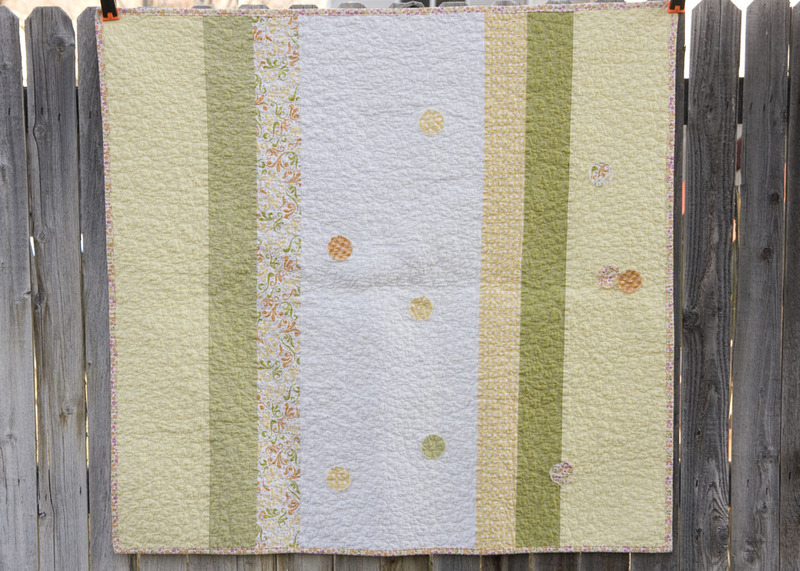 This is my fourth minky quilt I've made. I've learned every minky is different. 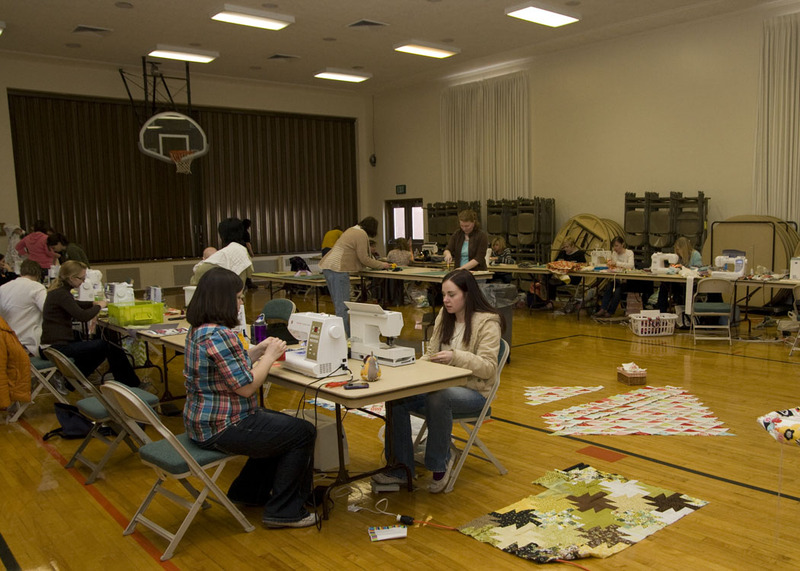 I found out it's harder when you are moving the quilt against the grain. It feels sticky no matter what. 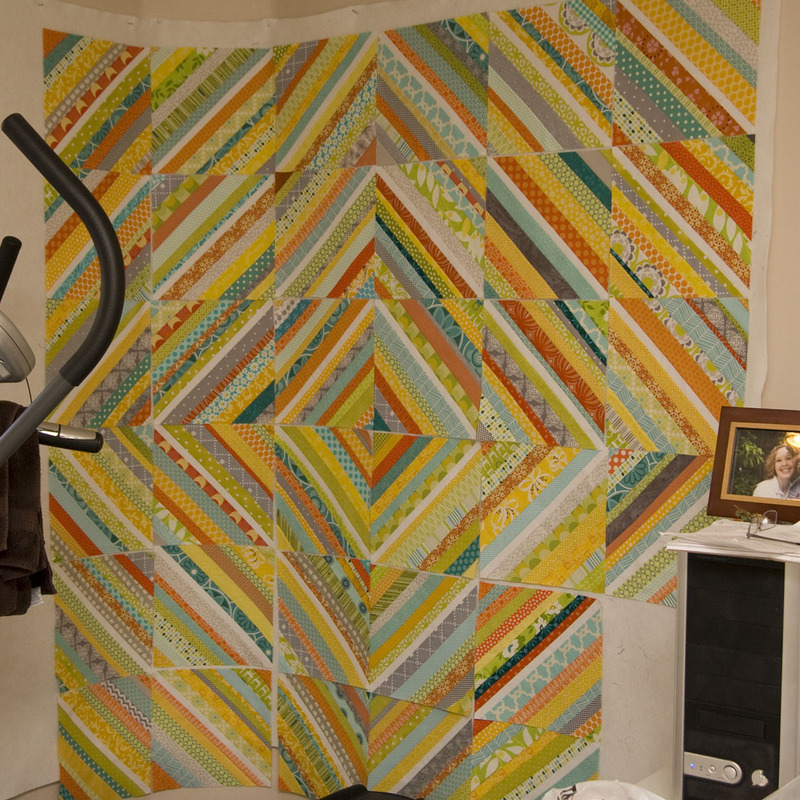 I used my heavy quilt gloves (leather gardening gloves) to handle this quilt. They are bulky, but give me better grip. I did a large loopy pattern to quilt this. 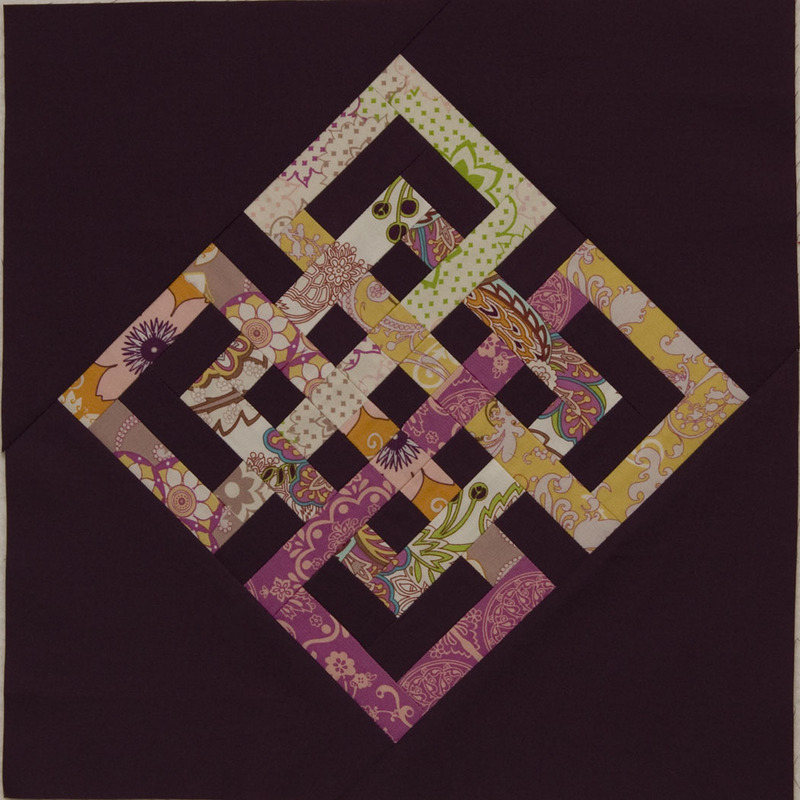 I was hoping it wouldn't mess up the nice paisley design on the minky, but after quilting you can barely see the paisley pattern. As always, I love the colors! 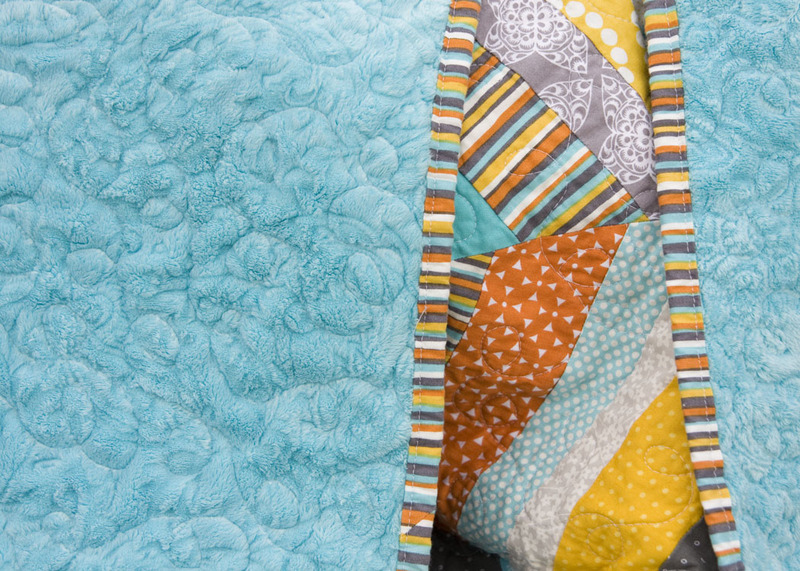 It's already a favorite cuddle quilt and lives in our front room. 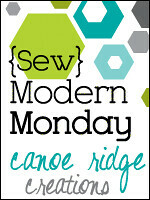 Linking up to Canoe Ridge Creations. But believe me it causes little girls to cry and almost makes moms swear. We were at the store, and this was sitting on the clearance table for $9. Miss C looked at it and turned to me and said, "Oh mom, it's a sewing machine just for me." Her big brown eyes looked up at me sweetly. "Could we get it please? 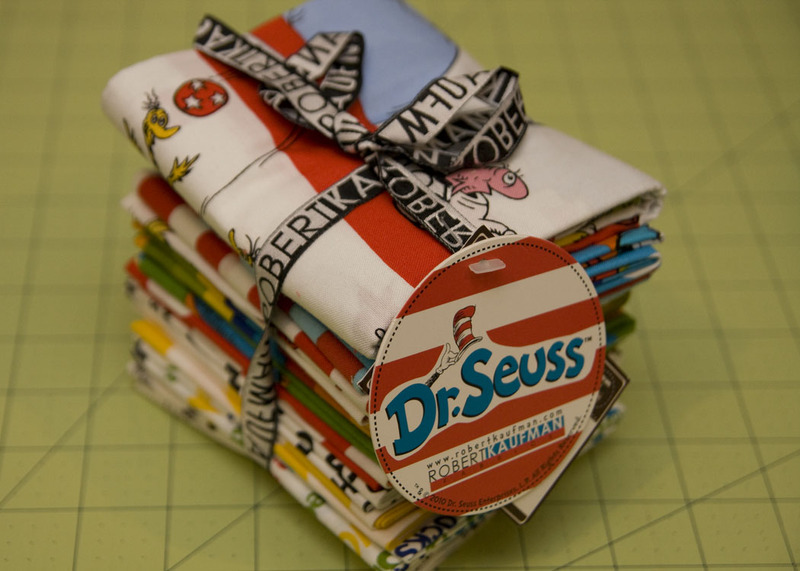 Then I can sew just like you." 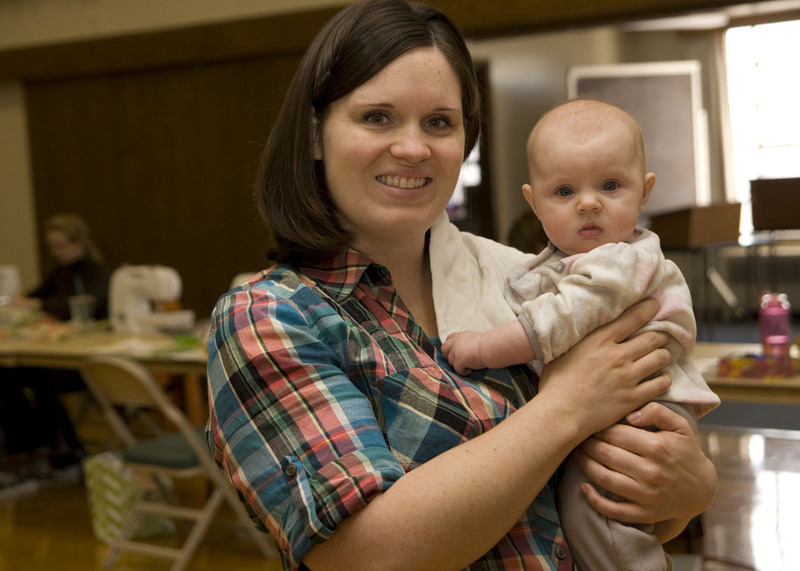 What's a mom to do?! We bought it, and she was soooo excited. Then the horror began. It just didn't work. Now for $9 I wasn't expecting a Bernina, but it just didn't work. We couldn't get it to sew for more than one inch. 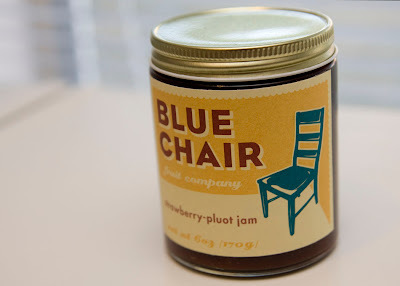 Then it would jam up. The needle would get unthreaded, it's next to impossible to thread. She would cry because it didn't work and she was so frustrated. I wanted to throw the thing at the wall. Finally, much to her dismay, I told her we were returning it to the store. 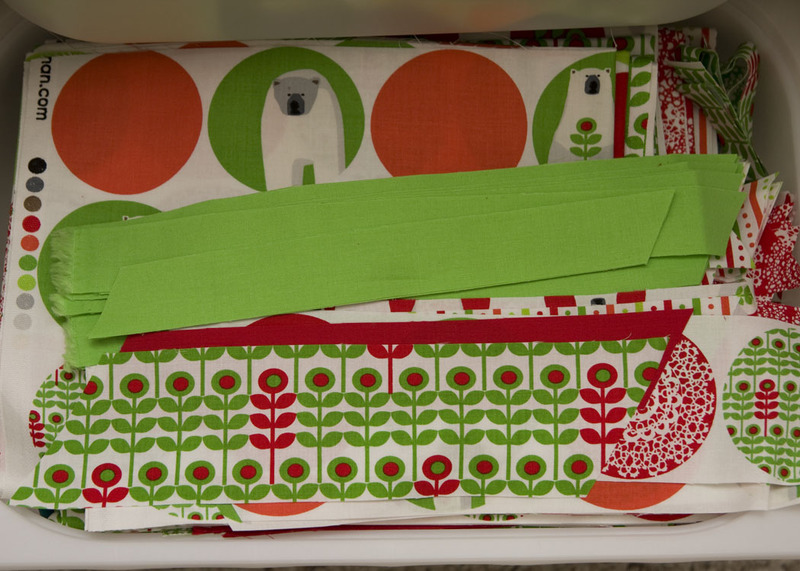 She was sad about it for a whole day until she finally accepted the sewing machine's fate. She loved the idea of sewing, and I want to encourage that in her little soul. Now, I'm asking all of you for advice. 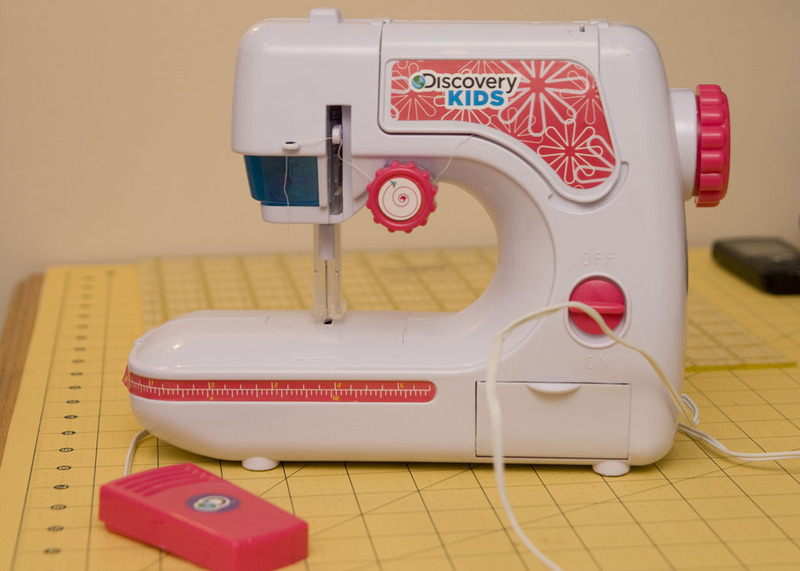 Are there any reasonably child-safe sewing machines out there that aren't cheap crap? 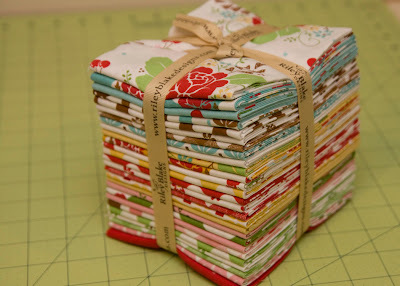 I would love to buy her something that is usable, but safe (AKA with the full needle guard). And to clarify, of course this would be with full supervision. I don't intend to leave her alone with a working sewing machine. Everything I seem to find online is junk. 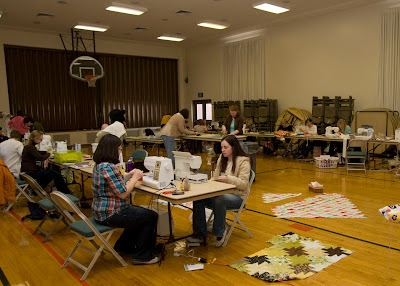 I haven't visited a sewing store yet to ask about products, but would love to hear any success stories. The machine was returned today. 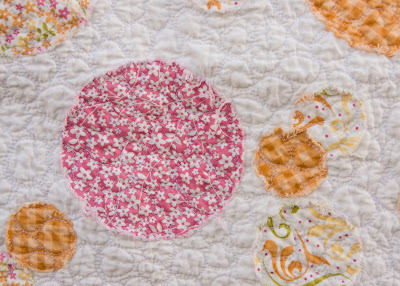 I now have my $9 back, but I have a sad little girl who misses her pink sewing machine. 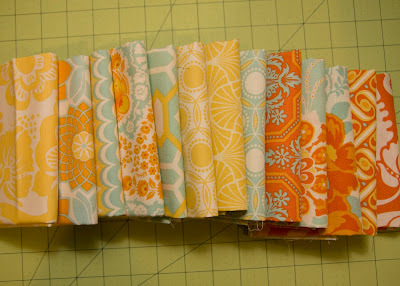 I loved reading everyone's ideas last week for the stash group, but Jessica wins with Slash the Stash. It just seemed perfect. So here's the deal. 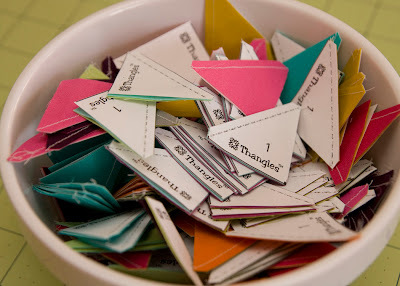 On the last day of the month, we'll do a link up party. 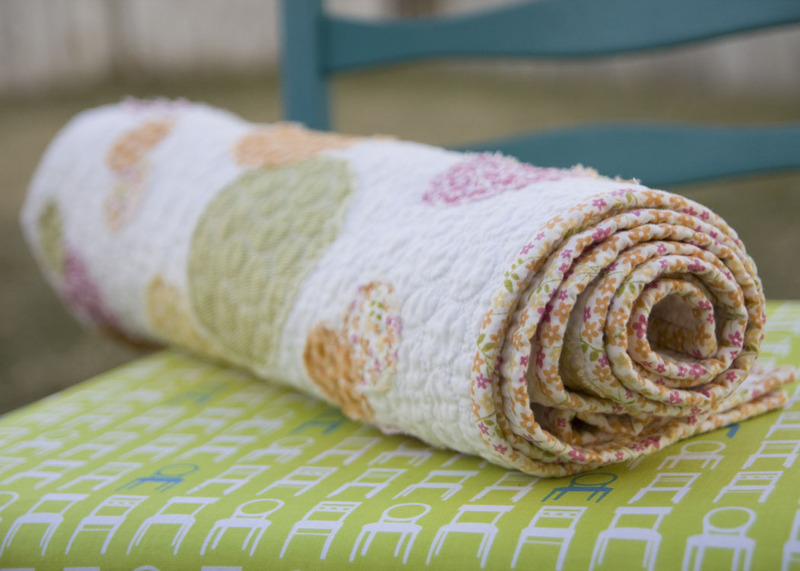 Just link to any stash project you've made during the month. The majority of the fabrics must be from your stash. I'll create a button that you can add to the end of a blog post. These don't have to be scrappy projects just stash. I'm halfway through piecing these blocks. It's nice, easy sewing when I'm not in the mood for something super technical. 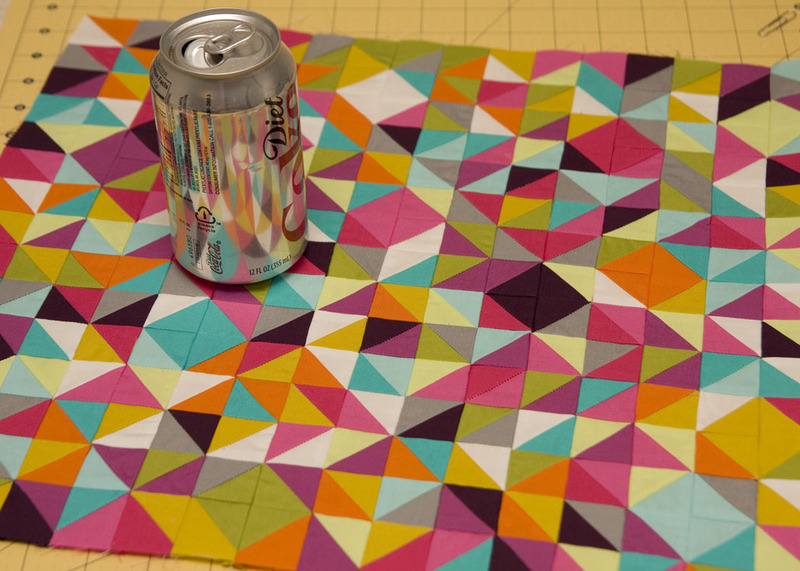 I haven't started piecing, but everything is cut. 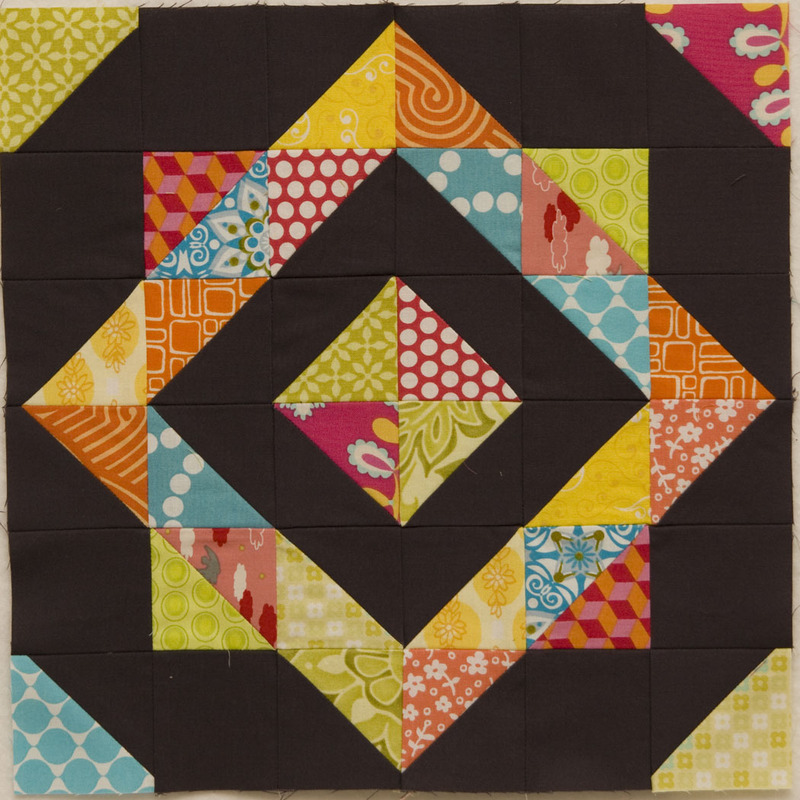 I started piecing the blocks together. I have rows almost complete. 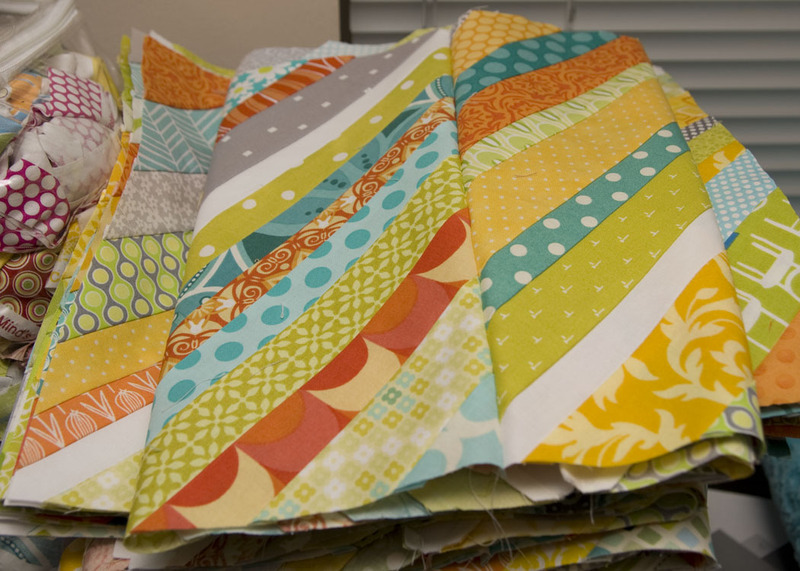 Just need to iron and sew the rows together, and I'll have a finished quilt top. Then to start the back. Remember this box from a few weeks ago? 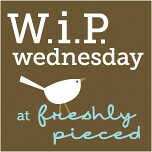 I really got going on it and finished the top and got it basted. I used some minky I had on hand for the back. I'm starting to really love minky quilts. This is only my second one for us, but my kids love the bee quilt I backed in minky. I also realized I really need to find a new favorite color combo. I think I've overdone this one. 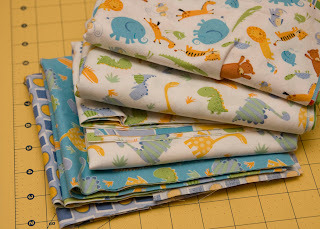 Here are pieces for five toy bags in a few sizes using Jeni's pattern, all cut and ready to sew. 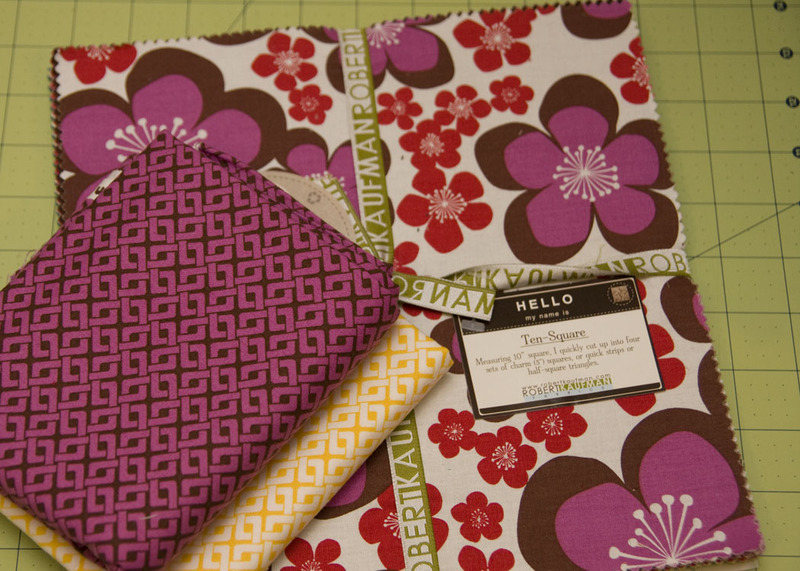 I've had this fabric on hand for a very long time. I made Little Dude a quilt from it, but the rest sat in the box way too long. I'm looking forward to having a few bags to help contain the toy mess. Okay, so this quilt is in the very beginning stages of creation. 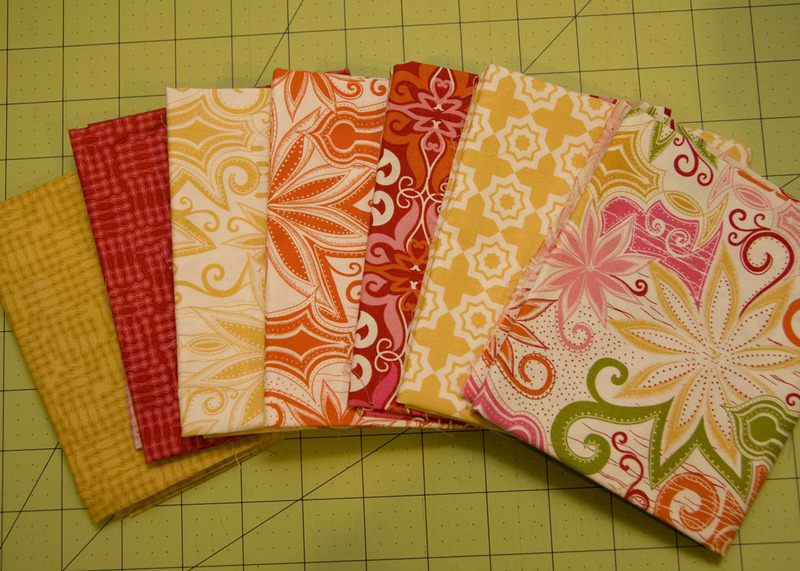 I won a fun 1/2 yard bundle of Heather Ross fabrics from Kim at My Go Go Life a while back. 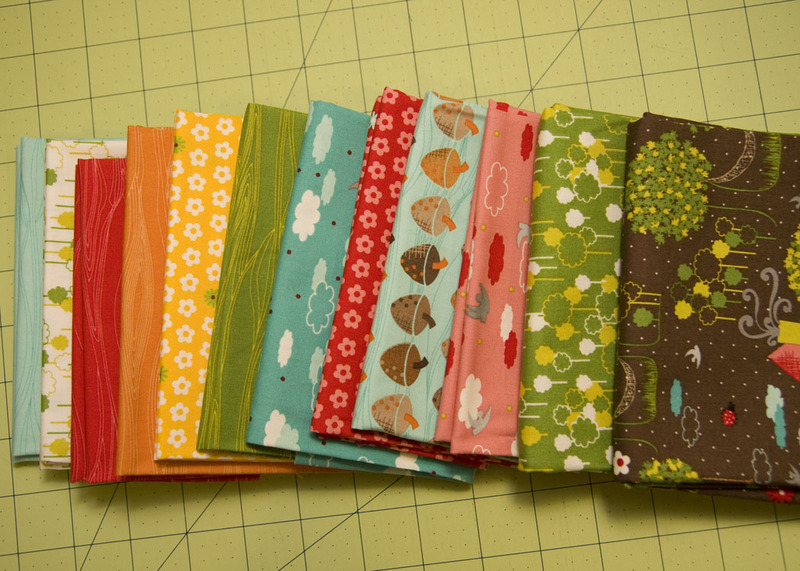 I wanted to pair them with some other HR prints and create a fun quilt. I asked my friend Leigh if she had a few scraps I could use. This is what she brought for me! Leigh is the biggest HR fan I know. These are her scraps. I'm floored and so excited to get started, especially with such a great collection. Finally, my last WIP I'll share in this post is my most recent bee block. This is for Lynne at Lily's Quilts, using her own tutorial for the Lynnebobsquarepants block. I was a little unsure of how it would look with the charcoal fabric she selected as the background. I don't usually do dark like this, but I really like it. I might have to give charcoal a try again soon. Slowly making progress. I think I need a bigger design wall. Designing this quilt is taking quite a while. Every time I walk into the room, I see squares that aren't quite right and keep moving things around. I have some new holes to fill. 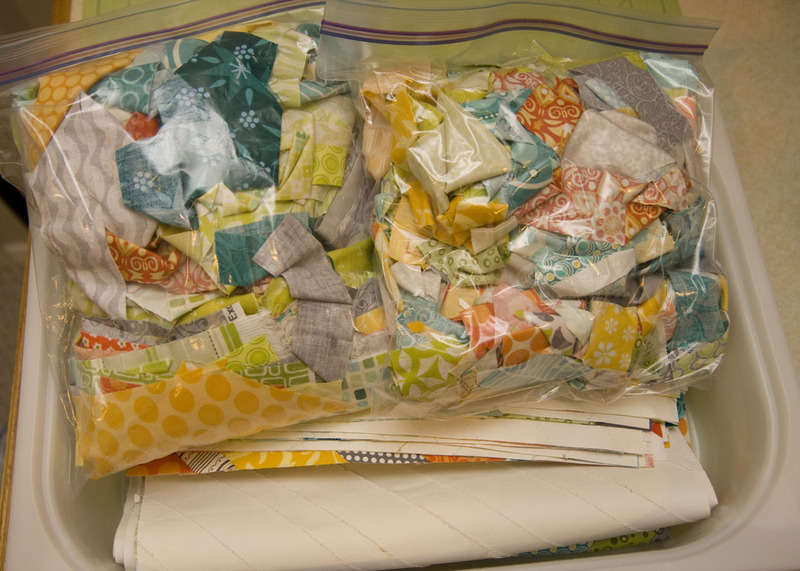 I'll have to pull a few fabrics from my stash to fill these. I also need to find some darker pinks to better blend the pinks into the reds. I'm loving it so far. It's going to be well worth the effort. It's been a day of the sickies around here. Miss C has been sick and droopy all weekend. She even passed up chocolate cake on Sunday and went to lay on the couch instead. Today is looking a bit better, but the kiddos all spent quite a bit of time vegging on the couch watching Dora this morning. I think the ibuprofen I gave her earlier is kicking in. She's off the couch and, she and her sister are currently having a tea party. She keeps calling her sister "young lady" in a wacky voice. She is also calling me "young lady mama" and told me I look lovely today--a wonderful compliment considering I didn't even bother putting on makeup this morning. The one and only good thing about sick kiddos is having a bit of downtime while they get their couch time. 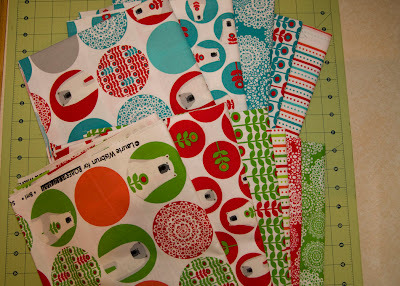 I cut fabric this morning for my Brrr quilt! I'm keeping my fingers crossed that it comes together just how I picture it in my head. I might start sewing it tonight unless I decide sleep is a priority. I'm on Ty Pennington's Blog today...or at least my quilt is. Check it out!! Makes my day!! My Pixelated Color Wheel quilt is right at the top! 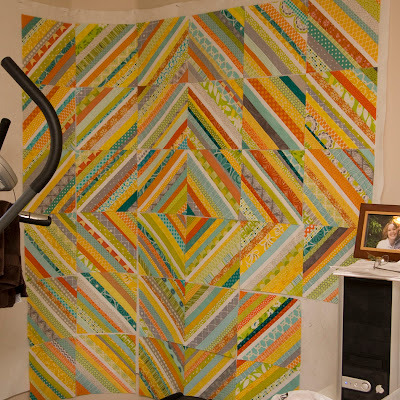 Well, I have officially finished my first quilt of the year. Believe it or not, I started and finished this little guy in 2012. It was a super quick finish. 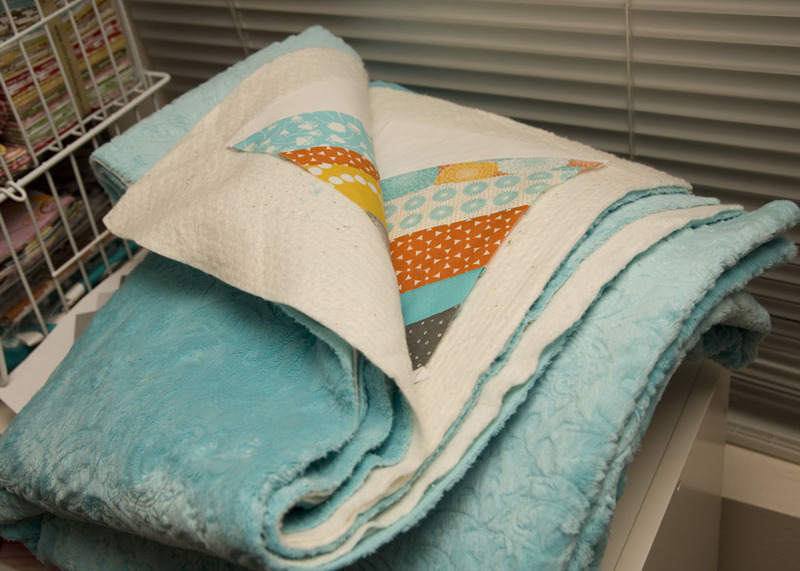 This is also my first official stash-buster quilt. Everything was from my stash. I bought the Sunkissed fabric last summer for another project that I never made. 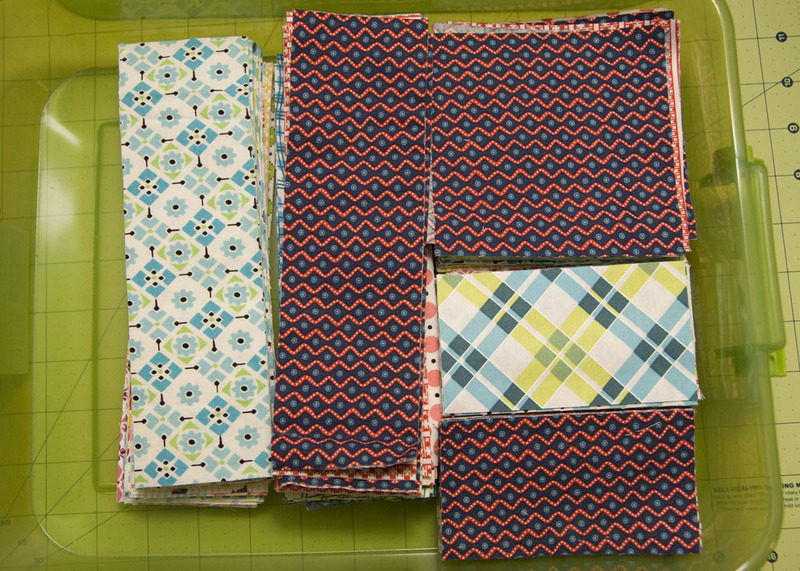 I had 1/4 yard cuts of 5 different fabrics, and a 1/2 yard of a 6th fabric, which I also used for the binding. I have wanted to do a quilt like this for a long time, but I have a serious dislike of applique. 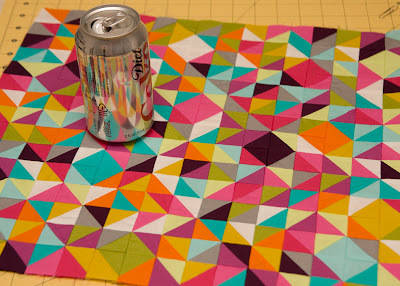 It's really the very last thing I want to do when it comes to quilting. I don't like the extra thickness from using Wonder-Under or something similar. I'm also not interested in starching each piece a million times to use that method. I know there are multiple methods, but none of them appealed to me so this design never happened...until now. See, last time I was spray-basting a quilt, I thought, "I wonder if this would work for applique." I decided to give it a try on a baby quilt for a friend. 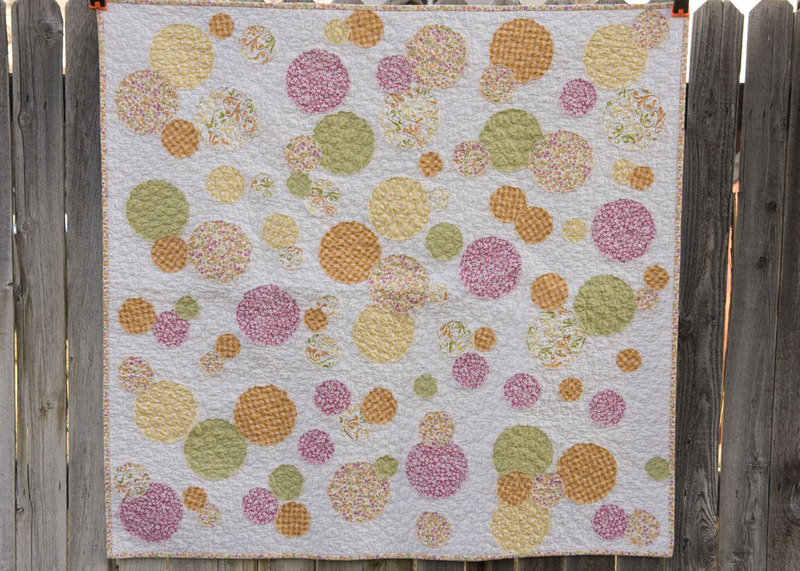 I used a piece of Kona snow about 45" x WOF for the quilt top, spray basted my quilt as usual, then sprayed the individual circles and just smacked them on top of the quilt in a random arrangement. 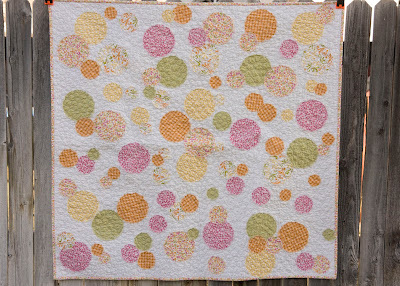 I laid out several circles at a time and sprayed them in a group over a few layers of paper towels. 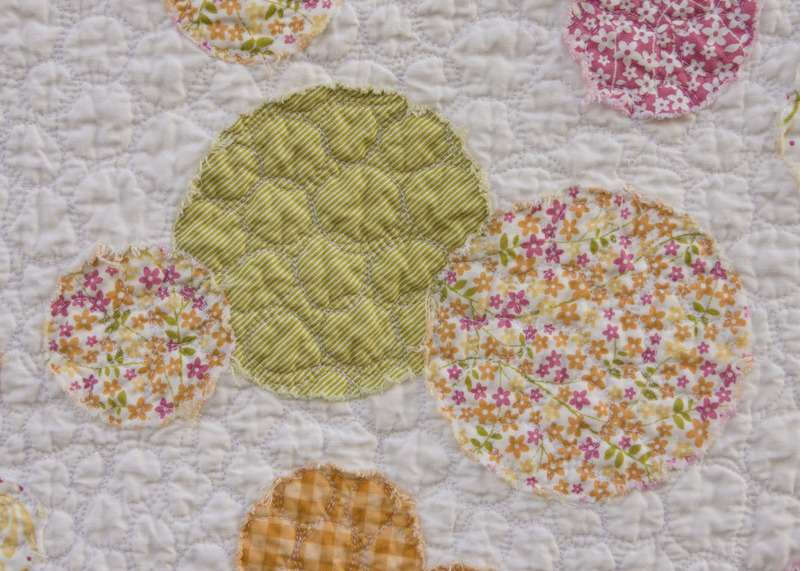 Then I quilted it like crazy with a pebble quilting design. I made sure I was about 1/4" from the edges of all the circles. After washing they frayed quite nicely. The back is pieced with the fabric I had left after cutting the circles as well as a couple Kona solids I found in the stash. 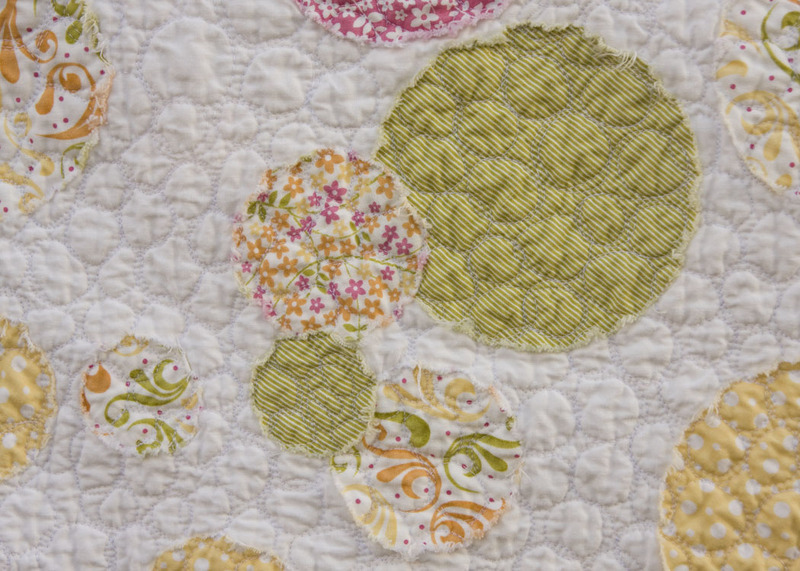 I didn't originally plan to put circles on the back too, but as I was piecing I found a flaw in the very center of one of my Kona fabrics. I just plopped a couple circles on top of it. I added a few extra so it didn't look lonely. I sprayed the circles pretty lightly. They started lifting off as I moved my quilt around. I think it would have been better had I sprayed them more heavily. 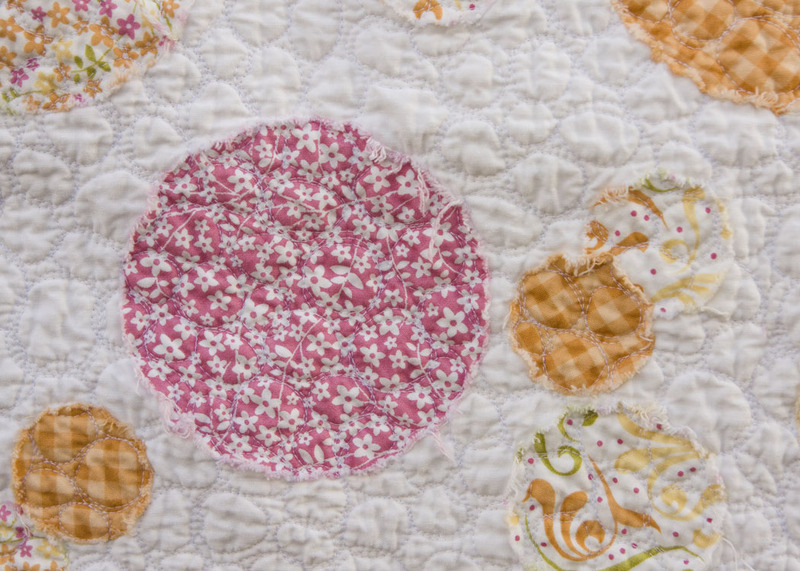 The edges of the circles got caught on my darning foot several times. I had to be more careful than usual. Overall it was totally worth it. 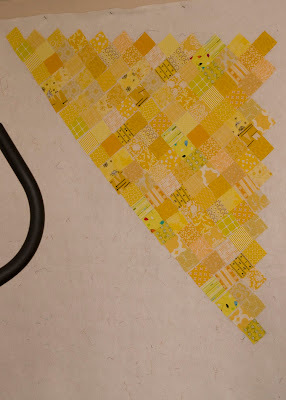 I don't think I'd do it on anything larger than a baby quilt, but I like applique just a little more today than I did last week. 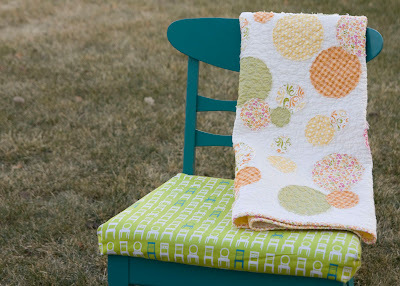 The baby for this little quilt is due in about a month. I hope she likes it!